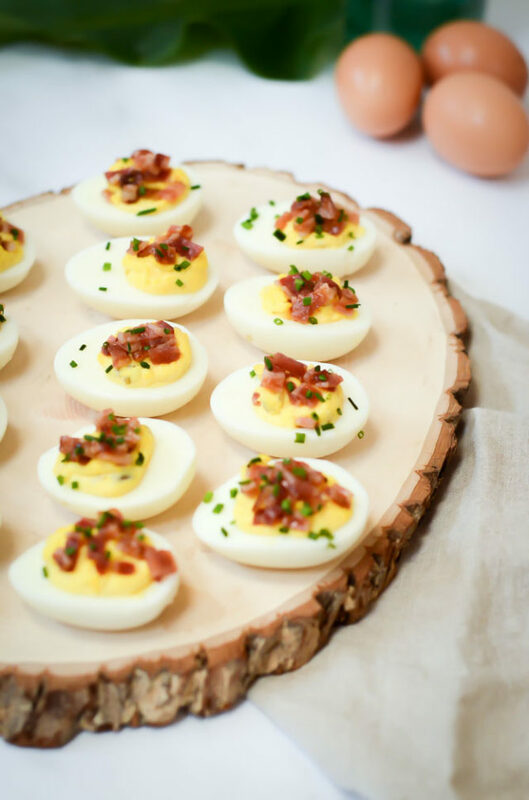 Deviled eggs get a tasty upgrade with the addition of sweet-and-spicy candied bacon. 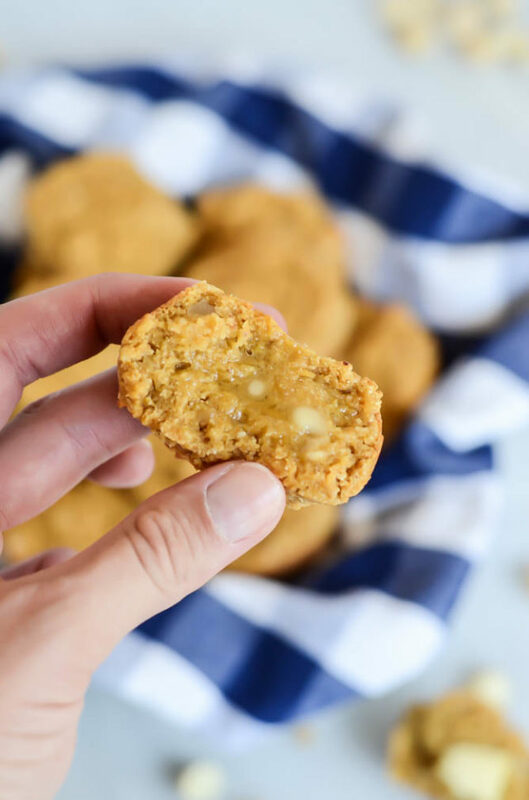 They’re the perfect appetizer to bring to Easter or your next potluck brunch and are sure to be a hit! If you’re a fan of deviled eggs, you better fasten your seatbelt, because the classic springtime brunch appetizer just got a whole lot better. 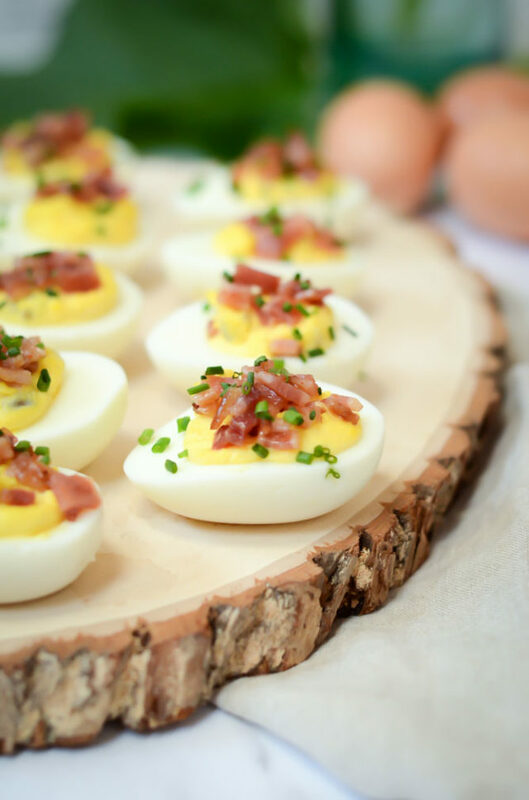 Yep, I’ve gone ahead and taken deviled eggs and upped the ante by sprinkling on the most delicious candied bacon, giving them the perfect hint of sweet, spicy AND crunchy. Let’s be honest, bacon makes everything better! Deviled eggs are one of those dishes that can be a bit intimidating to make, but really shouldn’t be. 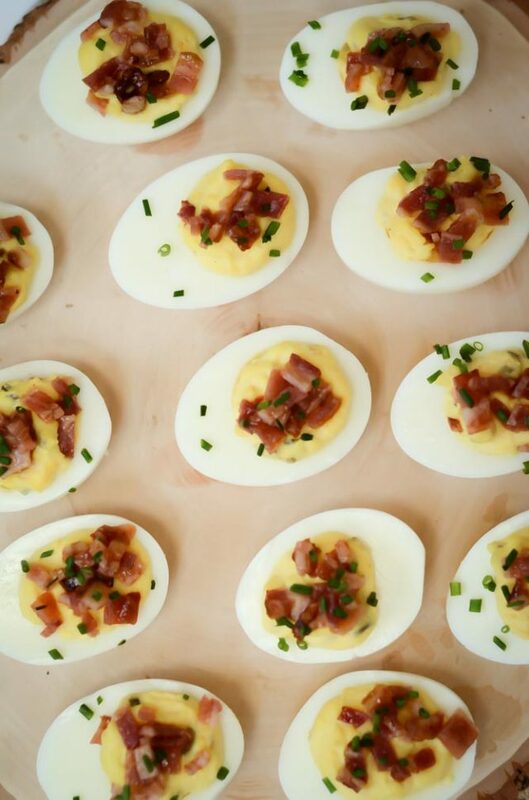 Once you get the technique down, you’ll most definitely want to be serving these for more than just your annual Easter brunch. The first, and perhaps most intimidating, step is hard boiling your eggs. There are lots of different techniques out there, from using a steamer to breaking out the ever-so-popular Instant Pot, but I prefer to stick to the good old-fashioned way of boiling them in water. It’s pretty darn foolproof and, after all, aren’t they called “hard-boiled eggs”? I’ve included my easy-peasy technique in the recipe directions below. You’ll never be intimidated to hard-boil eggs again! While you’re waiting for your eggs to cool down (that ice water bath is so crucial for easy peeling), you can whip up the candied bacon, which couldn’t be easier. All it takes is two ingredients and another foolproof cooking method to take our favorite breakfast treat from standard fare to sweet-and-spicy candied treat. Even though you’ll only need three slices of the bacon for the eggs, in the recipe I’ve included amounts for a dozen slices (an entire standard pack of bacon) so you’ll have plenty to snack on on the side. You can thank me later! Once the bacon is done and cooling, the next step is to make the filling. I’ve stuck to a VERY basic filling recipe (thanks, Mom!) but it’s for a reason, I promise. We want that sweet-and-spicy candied bacon to really shine through! Now that the different components are all prepared, you’re ready to compose your deviled eggs. I prefer to use a piping bag for the filling, but you can also easily use a Ziploc with the tip cut off or even a spoon. There are no hard and fast rules about this. Once you’re done with the filling, all that’s left to do is sprinkle on that oh-so-tasty candied bacon. See? I told you it was easy! Well, I’m not going to sugar coat it (hehe, pun intended), but you’re probably not going to be able to wait until whatever function you’re bringing these to to give them a shot. 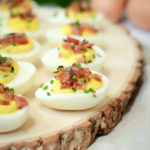 So give them a taste (you might need to eat two so as not to give your taste test away with an odd number of eggs when you get to the function), and then artfully arrange them so it’s not obvious. These do keep for a while in the refrigerator, but I encourage consuming them within one to two days for that candied bacon to really pop. If you’re transporting them, be sure to keep them tightly packed in a single layer so they don’t roll around or flip over. Well, what are you waiting for?? 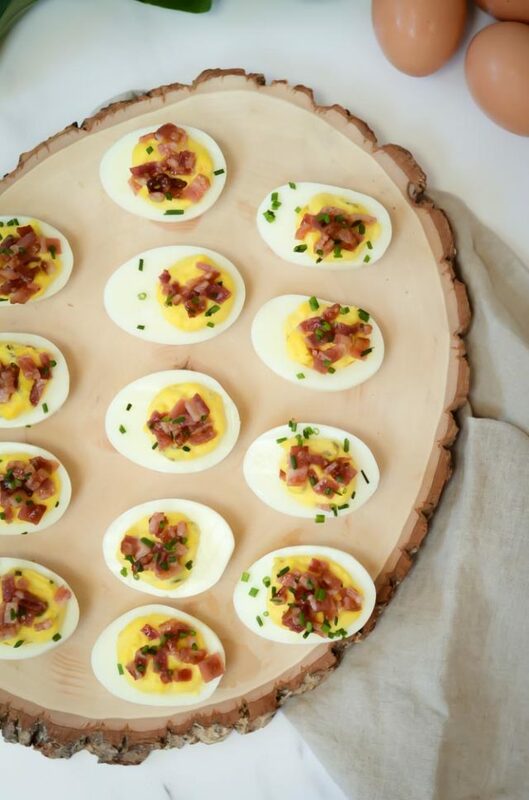 Hop to it and make some Candied Bacon Deviled Eggs ASAP! Place eggs in a large saucepan and fill saucepan with water until it comes to about an inch over the eggs. Place on a burner over high heat and bring to a boil. Turn off the heat, cover saucepan and let sit for 10 minutes. Once the timer goes off, transfer the eggs to an ice bath until they are cool to the touch. After the 12 minutes is up, remove the bacon and, using tongs, flip it over. Sprinkle the reserved brown sugar-cayenne mixture over the second side and return to the oven for 8-10 minutes, or until the bacon looks done and fairly crisp. Remove and let cool on the rack, turning off the oven. Peel your eggs and slice them in half vertically. Carefully scoop out the yolks and add them to a small mixing bowl. Next, add the vinegar, mayonnaise, relish, salt and pepper to the mixing bowl. Mash all of the ingredients together with a fork, until there are no large chunks remaining. Using a piping bag, Ziploc or spoon, divide the filling evenly among the whites of the eggs. Finely chop up three slices of the candied bacon and sprinkle over the top of each egg. To finish, sprinkle on some chopped fresh chives. 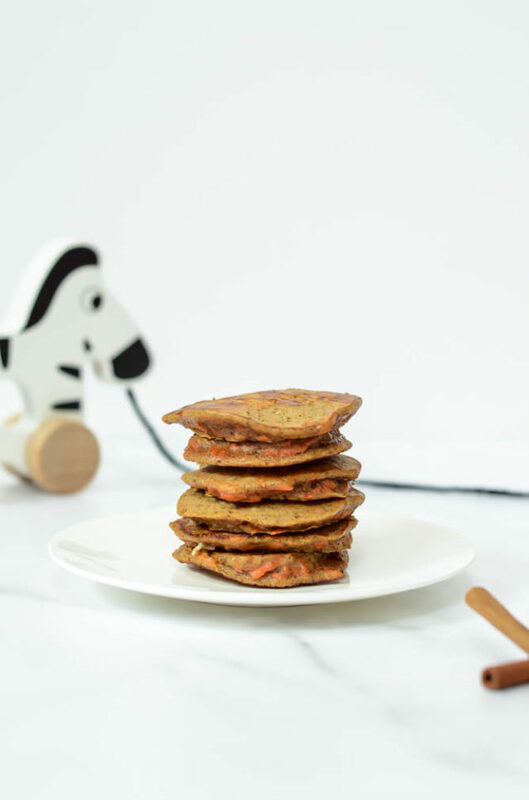 With whole grains and naturally sweetened, these Healthy Carrot Cake Pancakes are the perfect make-ahead bite for you AND all the little ones in your life. Who doesn’t like carrot cake for breakfast? *This post is the first in a series of recipes I’ll be doing that ascribe to the philosophy of baby-led weaning, which is the method we have chosen to introduce solids to our little one. We’ve already tested her on all the potential allergens included in the ingredients (eggs, wheat, etc.) and she shows no sensitivity. Please use your discretion to decide if these recipes will be right for your babe. Mother always knows best! All right mamas, you’ve been waiting so patiently and it’s finally here: my first baby-friendly recipe post! If you’re following me on my @caligirlkids (formerly @caligirlmomma) account, then you’ll know that we’ve been doing baby-led weaning with our little one. If you’re not familiar with baby-led weaning, the basic gist of it is trading in purees, mashes – your typical baby food – for solids and whole foods, essentially whatever you’re eating. You’re meant to allow your kid to explore, feed themselves and have a sense of autonomy about what they do and do not eat, which will (hopefully) set them up to be a more adventurous eater in the future. We started our little one on solids shortly before she turned 6 months old, and it has been so fun watching her explore, try new things, learn how to chew and swallow, etc. She’s eaten curry-roasted squash, salmon, omelets, so many things. In fact, we have yet to find something she absolutely refuses to eat. The only thing I have NOT loved about the “hidden veggie” method is the fact that you usually have to roast or steam the vegetable before you blend up the batter and, quite honestly, I usually don’t have time for that! So when I had a bunch of leftover carrots sitting in the refrigerator, rather than turning on the oven or stove, I decided to grate them and then throw them into the batter. Since babies are more sensitive to sodium than adults, I never add salt to Raia’s baked goods (or really anything I make her, for that matter.) Instead, I get creative with herbs and spices. For these Carrot Cake Pancakes, for example, I added the OG spices clove, nutmeg and cinnamon. I’m also really cognizant of how much sugar goes into everything I bake her. Banana and unsweetened applesauce are always great ways to add a touch of sweetness without too much added sugar, but in this particular case I opted to use some unsweetened apple butter we had sitting in the refrigerator. Finally, eggs and just a couple of tablespoons of flour (whole wheat, oat or almond would all work) bind everything together. 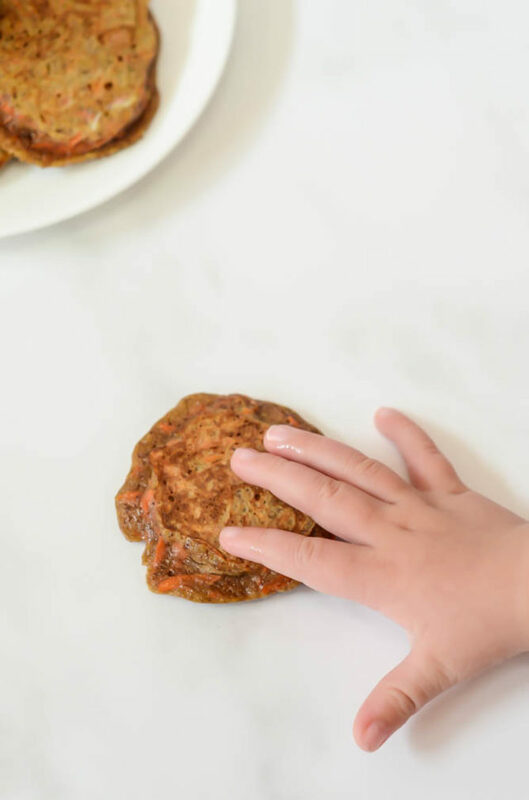 I love how every ingredient of these Healthy Carrot Cake Pancakes is just thrown into a blender and poured directly into the baking pan. Once baked, I often throw all of the goodies into the freezer and defrost as needed to cut down on food waste. It’s also great to have a stash of different things to choose from. I’ve got a lot more baby-friendly recipes coming your way soon but, in the meantime, if you have any questions or special requests, shoot me an email or leave them in the comments below! These healthy pancakes are every child's dream. 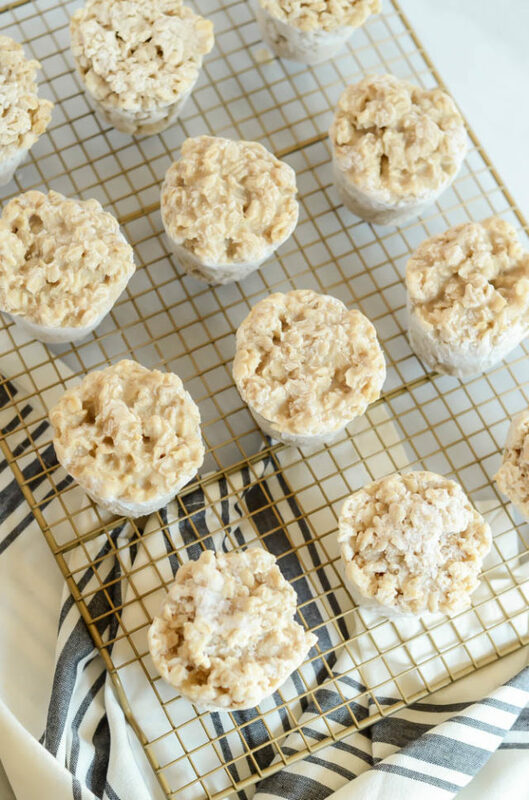 They taste just like carrot cake but use only whole grains and have no added sugar - the perfect breakfast or snack for babies and adults alike! Combine all ingredients (except butter) in a blender and blend on high until everything is combined. Melt a small pat of butter in a medium saucepan over medium heat. Once butter is melted and pan is hot, ladle in the batter to make silver dollar size pancakes. Cook pancakes over medium heat until edges begin to set, then flip and cook until batter is no longer runny. If you are working in batches, add another pat of butter when you start a new round. 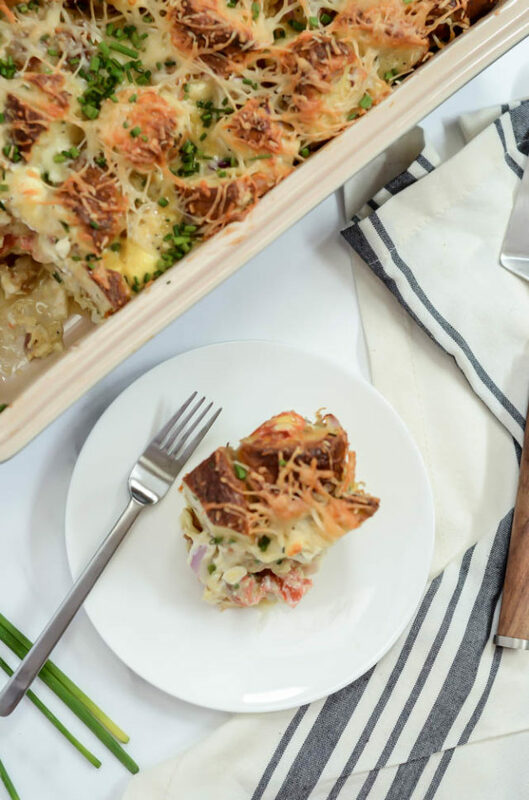 Good thing it’s Friday, because I’ve got an incredibly Indulgent Smoked Salmon and Bagel Breakfast Casserole to rock your weekend! 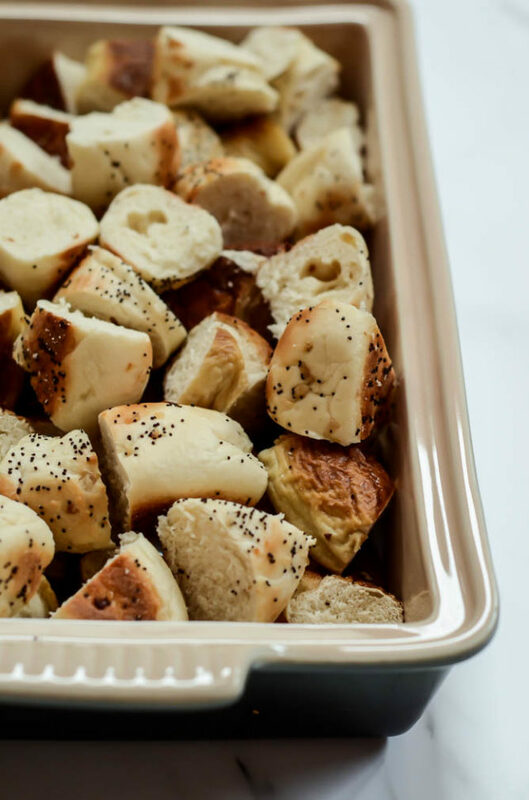 That’s right, I’ve taken just about everything that goes into your favorite bagel breakfast – we’re talking cream cheese, chives, smoked salmon, the works – and turned it into a tasty casserole that will feed a crowd. I mean, what’s not to like about that? 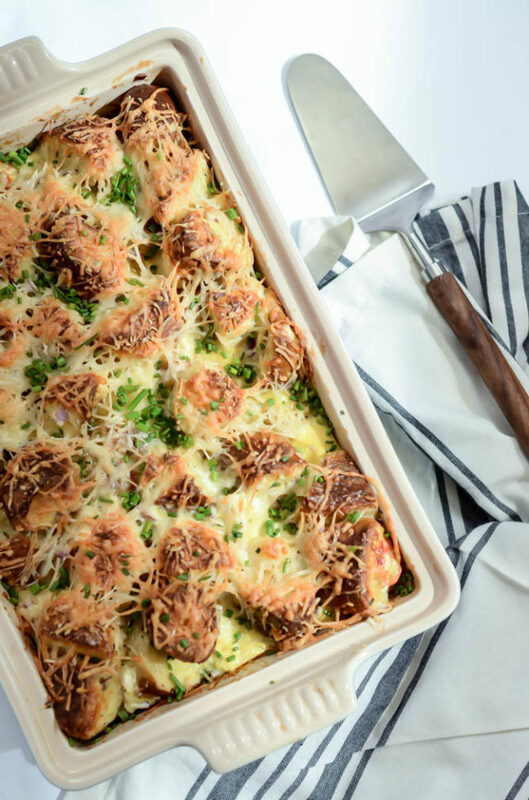 To be honest, I’ve been wanting to make something along the lines of an Indulgent Smoked Salmon and Bagel Breakfast Casserole for a looooong time, but have been struggling to find just the right excuse to make it – or enough people to feed it to. 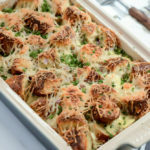 So when my Santa Barbara Foodie Gals decided it was time for our first picnic of the warm weather season, and a brunch picnic at that, I knew it would be the perfect opportunity to test this recipe out on a critical yet incredibly appreciative crowd. We opted to hold our season opener of a picnic at the Santa Barbara Mission Rose Garden, which is probably one of the most beautiful open, public spaces you’ve ever seen. It’s our favorite spot for picnics, with a large, open grassy area framed by a lush rose garden and our own historic mission, which still functions as a church today. If you’re ever in the Santa Barbara area and looking for some scenic spots in addition to your eating and drinking, this Rose Garden (along with the Santa Barbara County Courthouse, home to the Sunken Gardens) are not to be missed. We had quite the spread at our SB Foodie Gals get-together, and my Indulgent Smoked Salmon and Bagel Breakfast Casserole was a huge hit (although not the only star of the show as quiche, mimosas and donuts were also in attendance.) Needless to say, I got the approval on the recipe so I’m super excited to share it with you today! You know I’m the hugest fan of balanced living and whole foods eating whenever possible, so you should also know I’m not messing around when I call this dish indulgent. Gluten, dairy, cheese, CARBS – we’ve got it all in this bad boy, hence my emphasis on enjoying it only once in a while, in great company. It’s a dish that can serve a crowd, so it would be the perfect addition to an otherwise balanced brunch menu. In fact, a fresh fruit salad and crudité platter would be the perfect accompaniments! When it comes to bagels, feel free to use whatever flavor you prefer to pair with your lox. I used a combo of onion and pretzel, but I also think everything bagels, rye, salt or even plain would be just fab here. Also, I baked the casserole pretty much right after I assembled it, but I’m venturing to guess that prepping it a little bit in advance (maybe even the night before?) might be a VERY smart idea. 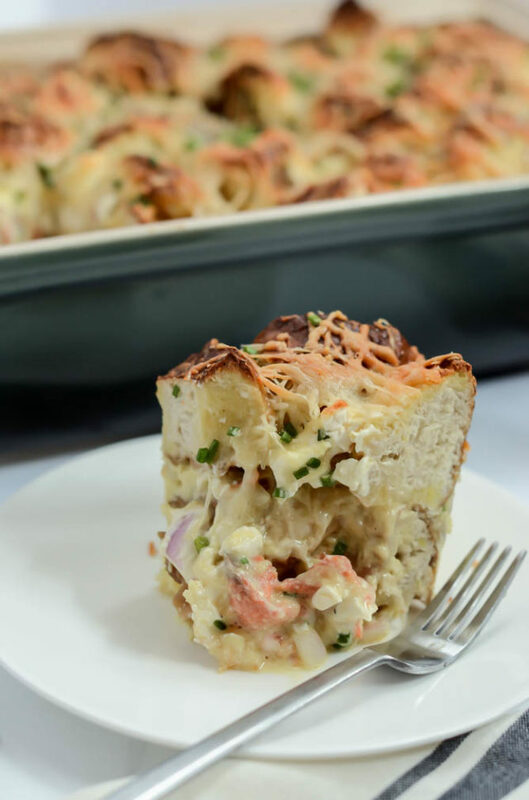 After all, after everything is mixed together and loaded in the casserole dish, your Indulgent Smoked Salmon and Bagel Breakfast Casserole is pretty much “set it and forget it,” and who doesn’t want that when you’re trying to entertain a crowd? 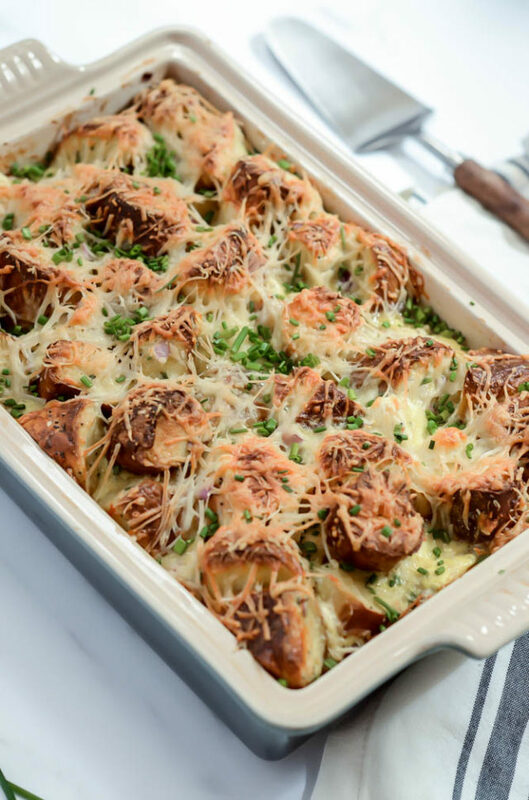 This make-ahead casserole is loaded with bagels, smoked salmon, cream cheese and all your other favorite bagel toppings, and is perfect to serve a crowd! Preheat the oven to 400 degrees Fahrenheit. Pour melted butter into a 15-quart baking dish and turn to coat dish. Set aside. Pour mixture into prepared casserole dish and sprinkle 1 cup grated Parmesan over top. Let cool slightly and sprinkle on additional tablespoon of chopped fresh chives before serving. 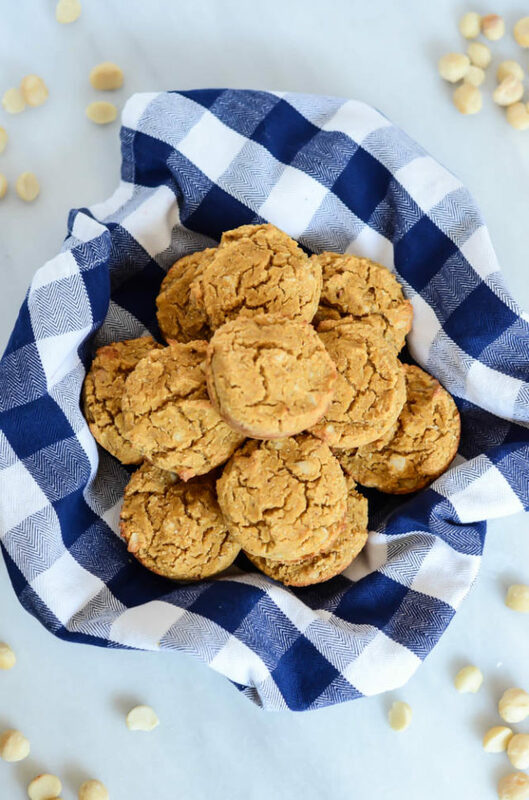 Because these Easy Pumpkin Macadamia Nut Muffins are incredibly worthy of your breakfast table this week and all the weeks remaining that are perfectly acceptable to eat all things pumpkin at every meal. 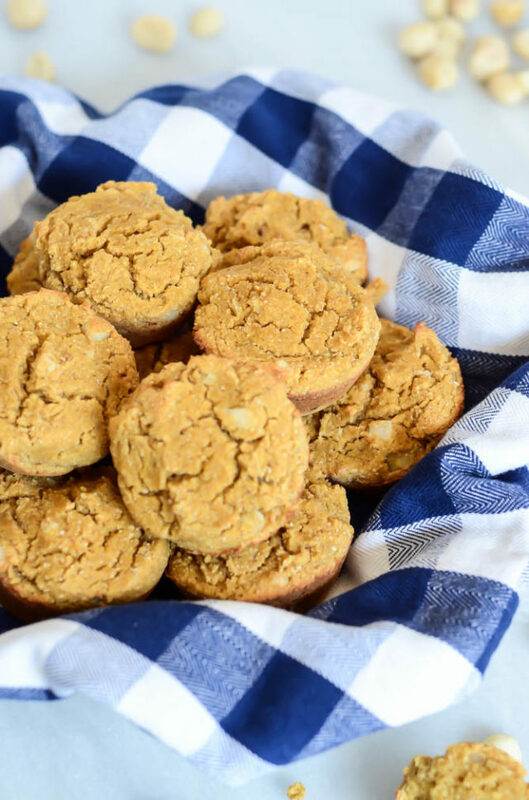 True to their name, these Easy Pumpkin Macadamia Nut Muffins are a snap to make. They are also incredibly moist (gotta love pumpkin in baked goods for that very fact alone) and not only loaded with the healthy orange stuff, but also tons of protein and Vitamin A from toasted macadamia nuts. There’s also a fun twist to the base of these muffins that I stole from my friends at Big Sur Bakery – I used half good ol’ AP flour and half coconut flour to give them an extra tropical twist (and more healthy protein, fiber and fats.) Let me just tell you, if you haven’t tried baking with coconut flour yet, give it a shot! It adds a wonderful, crumbly texture and nice coconut-y flavor. I’m no expert in gluten-free baking, but I will say that I have found I still need to use some of the regular flour to hold everything together, otherwise everything just falls apart, but if any of you GF eaters out there have any suggestions on how to get things to hold together without it, I’m all ears! 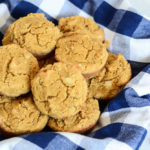 I love these Easy Pumpkin Macadamia Nut Muffins because they are not overly sweet and therefore perfectly justifiable to enjoy for breakfast, a snack or even a healthy(ish) dessert. However, if you feel like adding a bit of indulgence, I think a dash of white chocolate chips would just be BOMB in these and if you end up doing this please bring me some because I really want to try it and right now I’m laid up in bed with the most adorable cuddly newborn ever with no heavy baking plans in my immediate future. Once you have all the ingredients, the muffins come together in just about 30 minutes. 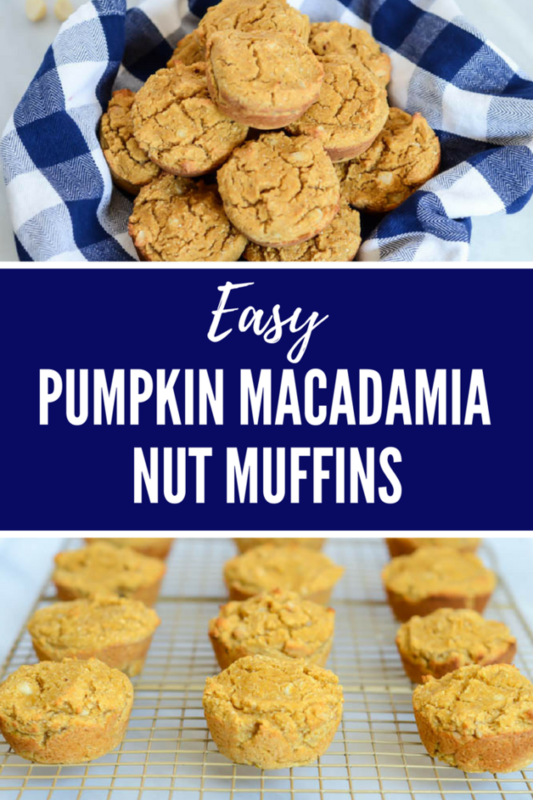 I would also like to mention that they freeze beautifully, so if you’re looking for a tasty make-ahead breakfast you can have ready in a flash on a busy holiday morning, these Easy Pumpkin Macadamia Nut Muffins are the answer. 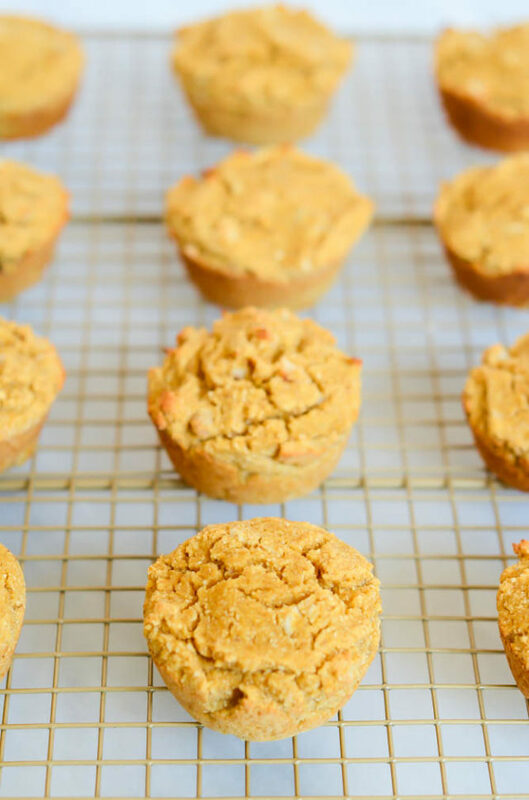 These easy muffins are full of healthy ingredients like pureed pumpkin, heart-healthy macadamia nuts and fiber-filled coconut flour. Preheat the oven to 400 degrees Fahrenheit and either line a muffin tin with paper liners or spray it with cooking spray. In a medium bowl, whisk together both flours, baking soda, salt and pumpkin pie spice. In the bowl of a stand mixer fitted with the paddle attachment, add both sugars and the eggs and mix on medium-low until combined. Add in the pumpkin, almond milk and vanilla extract and mix again until combined. Mix in the dry ingredients, then stir in the orange zest and macadamia nuts. Scoop batter into prepared muffin tins and bake at 400 degrees for 20 minutes, or until a cake tester inserted into the center comes out clean. Let cool 10 minutes in pan then remove from pan onto a wire rack to cool completely. Two weeks (plus or minus a few days) until Baby D’s due date and things are getting real. I’m rushing around trying to get a bunch of things done before she gets here, but I’m also trying not to stress myself out too much because I know right now I need to be focusing on relaxing and not being too exhausted whenever I go into labor. 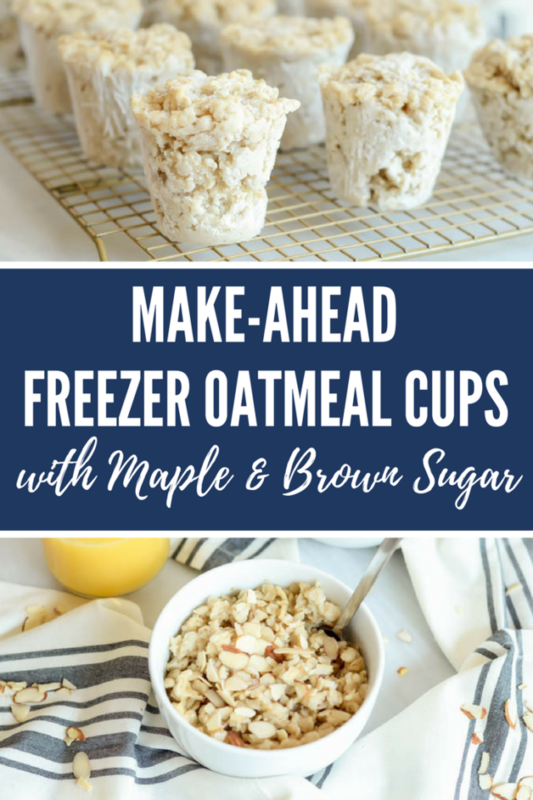 I’ve got a few meals (and baked goods) stocked in the freezer and I have to say that one of the things I’m looking forward to the most are these Make-Ahead Freezer Oatmeal Cups with Maple and Brown Sugar, so naturally I wanted to share them with you! I’ve had these in my mind to make for quite some time, and I figured there’s no time like the present to give them a shot. I mean, who doesn’t want single-serve batches of brown sugar and maple-flavored oatmeal ready to go at a moment’s notice when they’ve got a newborn baby in their arms? 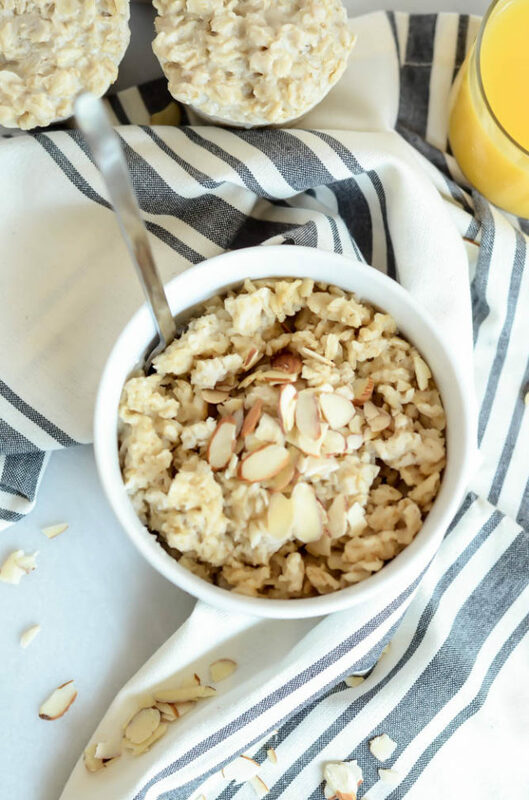 Not only is it a quick and easy breakfast or snack solution for what I’m sure is going to be a crazy time for us, I also hear oatmeal is good for lactation and, since I’m trying to breastfeed as much as possible, I want to get that milk flowing! If you’re as much of a fan of Trader Joe’s as I am, then you may have come across THEIR version of freezer oatmeal packs which I absolutely love. I haven’t made them much since I’ve been working from home since I have a little more time (and the hubs likes his Protein Power Smoothie in the morning), but when I was working my 9-to-5 I loved being able to pop them in the microwave for a couple of minutes and have a delicious bowl of non-instant oatmeal on days it would otherwise be impossible time-wise. There’s really not anything tricky about my version of Make-Ahead Freezer Oatmeal Cups with Maple and Brown Sugar. In fact, they’re a meal-prepper’s dream come true. 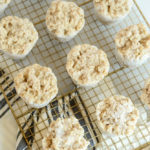 You’ll simply cook up some high-quality oatmeal on a morning you have a little extra time, flavor it with tasty (and very seasonally appropriate) maple syrup and brown sugar, dollop a hefty scoop of said oatmeal in some jumbo muffin tins, and pop them in the freezer. Once they’re set, you can pop them out of their tins and wrap them up individually for an easy grab-and-go breakfast that everyone in your family is sure to love, not just busy breastfeeding moms! Seriously, though, they are like a little taste of homey comfort food that you can enjoy on any day of the week. 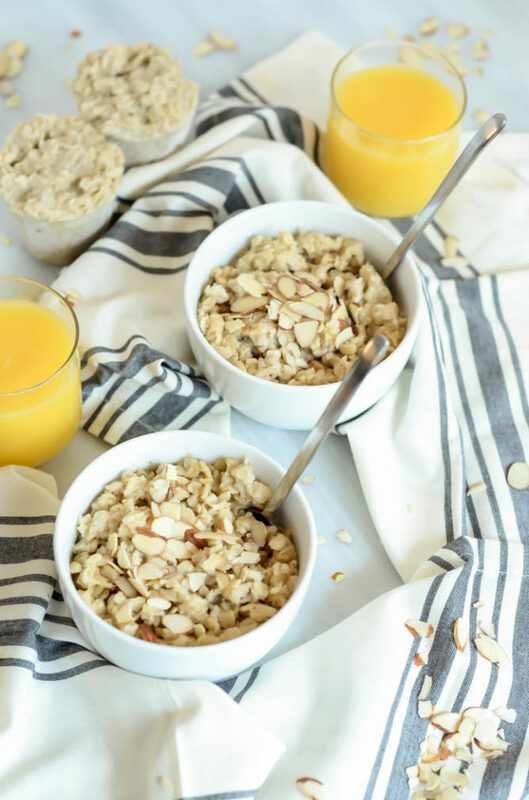 As long as you have a couple of minutes to give the cups a quick spin in the microwave, you’ll be setting yourself up for a REALLY good day with a tummy full of healthy, filling oatmeal that tastes like it took you at least an hour to make. 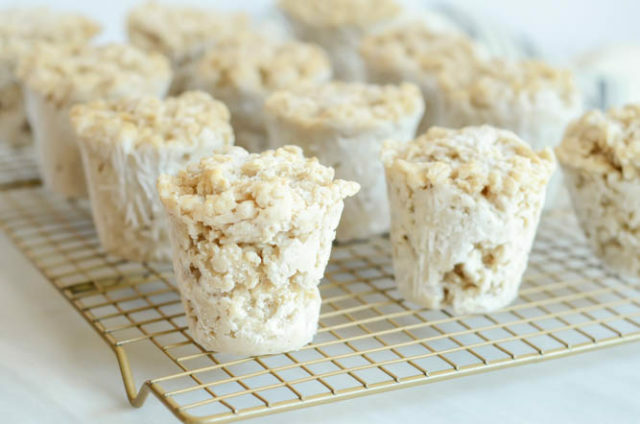 Now, enough about delicious Make-Ahead Freezer Oatmeal Cups with Maple and Brown Sugar, on Friday I promised I would tell you about the fun, surprise-filled weekend we had. It was one we’ve had on tap for at least 5 or 6 months now, basically ever since we found out I was pregnant. Chris’ mom’s 70th birthday is this week (tomorrow, to be exact) and we wanted to do something really special for her. Unfortunately, since I’m ready to pop any day now, we knew we wouldn’t be able to travel to celebrate with her, so we decided to bring the party here to Santa Barbara. We talked all of Chris’ siblings into coming to town (yes, all four of them, even his sister from Texas!) and rented a sweet house just up the road from ours. Chris was able to convince his parents to come visit, but mom thought she was just coming to see us and stay at our house. Little did she know that the whole family would be here, and staying at a beautiful vacation home to boot! 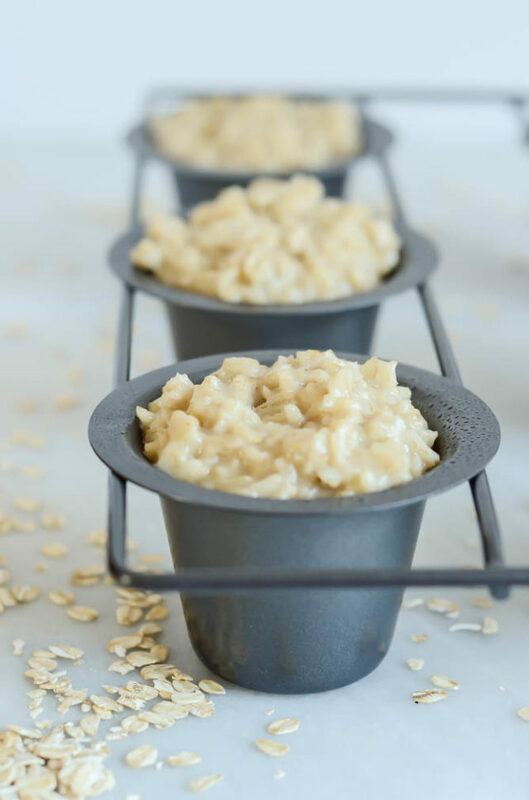 These convenient, single-serving oatmeal cups are laced with maple and brown sugar and make the perfect on-the-go breakfast for busy mornings! Bring coconut milk, water and salt to a boil. Reduce heat to medium and add oats. Cook for about 20 minutes, or until most of the liquid has absorbed into the oats, stirring occasionally, then stir in the brown sugar and maple. Spray some jumbo muffin tins with cooking spray and scoop oatmeal evenly into the cups. Place in the freezer until solid, at least a couple of hours or overnight. Remove the tins from the freezer and, using a butter knife or small offset spatula, gently loosen the oatmeal cups from each tin. Wrap each cup in plastic wrap and place back in the freezer. When you’re ready to heat up your oatmeal, take one of the cups, unwrap it and place it in a microwave-safe bowl. Microwave for 2 to 4 minutes, stirring occasionally if needed and top with any additional toppings you desire. Some of my favorites include nuts, peanut butter and more maple syrup.